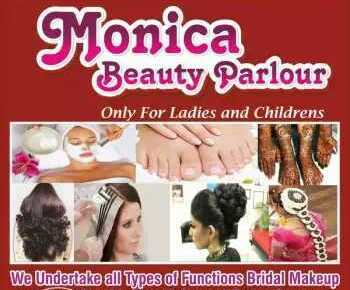 Monica Beauty Parlour is the exclusive Ladies Beauty Parlour in Bangalore. Monica Beauty Parlour is a Ladies Beauty Parlour in Bangalore exclusively providing services for Ladies & Children in Bangalore. We have our Ladies Beauty Parlour in Bangalore located in the Heart of City with modern facilities and advanced Beauty Treatment done by the beautician Radha. Radha is a Experienced Beautician running Monica Beauty Parlour since past 5 years. We have satisfied customers who have been part of our successful journey in Bangalore City. Monica Beauty Parlour Ladies Beauty Parlour in Bangalore is providing all types of beauty services like Mole Removal, Fairness Treatment, Advance Facial, Eyebrow Piercing, Whitening Facial, Hair Smoothening, Pedicure, Manicure, Bridal Makeup, Mehendi services etc.